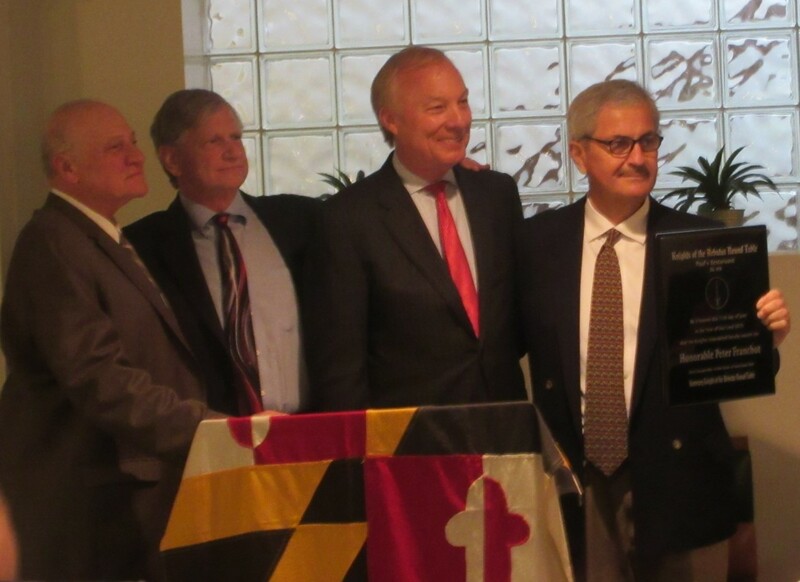 Photo above: Comptroller Peter Franchot is named a “knight” of the Arbutus Roundtable. From left: Attorney Manny Annello, Baltimore County Orphans Court Judge Arthur Frank, Franchot and Clem Kaikis. Maryland’s chief tax collector, Comptroller Peter Franchot, supports a long-term moratorium on increases on taxes and fees, but he also opposes major tax cuts. “We should have a multi-year moratorium on taxes and fees,” Franchot told the Arbutus Roundtable Monday as the group of generally conservative Democrats honored him for his fiscal responsibility. The comptroller had opposed many of the tax hikes during the O’Malley years, a constant target of Republican Gov. Larry Hogan during his campaign. But, Franchot said, “I think the idea of major tax cuts is not sustainable…. Let’s have stability and certainty” in taxes. He believes that’s what businesses prefer based on his travels around the state. This puts him somewhat at odds with Hogan, who has promised to roll back as many of 40 increases in taxes, tolls and fees he possibly can once he gets spending under control. The governor and legislature balanced the state budget with no new taxes, but the legislature rejected two of Hogan’s proposals for a reduction in small business property taxes and the automatic inflation increases in the gasoline tax. Hogan was able to reduce tolls through action by the Maryland Transportation Authority last week. Franchot’s anti-tax position had no noticeable impact on O’Malley and the legislature. But he and Hogan have become allies on the Board of Public Works on getting a better handle on state contracts. “Our state procurement process is broken,” Franchot said, echoing frequent comments over the years in which he said he’s voted on 18,000 contracts amounting to $85 billion. “We’re going to come up with a series of procurement reforms,” largely management reforms at the board level that will not need new laws. “I think you’re going to see dramatic shifts at the Board of Public Works,” he said, though none are coming immediately. Wednesday morning’s board meeting has an unusually long 316-page agenda with 168 items because the April 29 meeting had been cancelled due to the state of emergency the governor declared in Baltimore City. The meeting kicks off with a ceremony honoring Jerome Klasmeier, the assistant comptroller who is retiring from government service a second time. Klasmeier’s replacement as assistant comptroller and liaison to the board is John Gontrum.